Sir Valrigard, a knight who had once served under King Skarl, has been locked away deep in the dungeon of Meridell Castle for a crime he did not commit! Determined to escape and have his good name cleared, he must fight his way out and have his revenge on the one who framed him. If I'm a prisoner, why did they let me keep my sword? 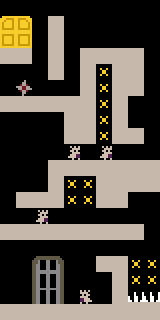 Starting at the bottom of each level, Valrigard must navigate his way to the exit door at the top before time runs out. On the way, he must avoid enemies and hazards and use his wings to reach hard-to-access places. 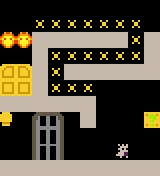 Also within the levels are boxes and stars that can be collected to gain extra points and lives. There are a whopping 19 levels in this game to explore, along with a final showdown with Valrigard's captor and a special bonus stage! Move Valrigard with the left and right arrow keys. Use the up arrow key to make him jump; if you keep pressing it after the initial jump he will fly upwards! He can only fly for a limited amount of time, however, and will eventually need to land to rest. Pressing the space bar will make him swing his sword. The point system in Escape from Meridell Castle is a little strange. The first enemy you defeat in any given level is worth the total number of enemies in that level. For each additional enemy you dispatch, its point value will be the total number of enemies minus the amount of enemies defeated. As an example, the first level has 7 enemies, so you will get 7 points for defeating the first one, 6 points for the second, and so on. If you complete the game, you will be awarded 300 bonus points. Scattered throughout the levels are stars; each star is worth 1 point and collecting 100 of them will earn you an extra life. Stars are usually placed in dangerous places near spike pits and other hazards and you should only collect them if you think it is worth the risk. Also within each level are mystery boxes that will give you a random amount of points when you fly up into them from below. The point values are 1, 2, 3, 4, and 100. Despite what the instructions tell you, you cannot get over 100 points from a single mystery box. Valigard is fragile and will die the moment he comes into contact with any enemy or hazard. After death, the level will restart and he will be placed at the beginning again. Everything in the level will be replaced, but you will retain your score. Valrigard begins the game with 3 lives, but it should be noted that 0 counts as a life in this game, so technically he has 4. Grarrls Pace back and forth on platforms. Can be killed. Korbats Fly back and forth between walls. Can be killed. Splykes Dart quickly across platforms and spin. You can pass by these while they are spinning if you swing your sword right before you collide with them. Can be killed only when stationary. Cannons These will take aim and shoot at you; every few seconds they will shoot a much faster projectile that is difficult to dodge. Attack them with your sword for points as you would on a regular enemy. When you do this, you will hear a sound, but it will not kill it. Flamers Move up and down vertically. Cannot be killed. Spikes Stationary hazards that will kill Valrigard on contact. Spike Balls Move horizontally between walls like Korbats. Cannot be killed. Acid Blobs You will see these on the ceilings of some levels. The goo that drips from them will kill Valrigard on contact. Where the goo drips from on the blob is randomized. Wizard The finall boss! Since he is the only enemy in the final boss room, he is only worth 1 point. He can fly in the air and shoot fireball projectiles at you. Stars Each star is worth 1 point, collect 100 for an extra life! Mystery Boxes Will randomly award either 1, 2, 3, 4 or 100 points. Conveyor Belts A platform that will move Valrigard when he stands on it. Energy Orbs These will refill Valrigard's energy meter. You will only see them in level 11. If you are trying for the avatar, you will need to be in the top 50 on the high score table. To get a score high enough to qualify, you can purposefully die at the end of certain levels and replay them to maximize your points without having to play through more difficult later levels. Level 7 is a common recommendation, but you can also choose which one is best for you using our level guide. You can also reset the game until you get 100 points out of the first mystery box! While playing, take note that Valrigard's hitbox is uneven with his sprite. Enemies and hazards can brush up against his back without him dying, but it also extends beyond his body from the front, making it very easy for him to die while flying in front of or landing near spikes. For this reason, you should always swing your sword a little early to make sure you don't collide with enemies and give yourself some distance between hazards. 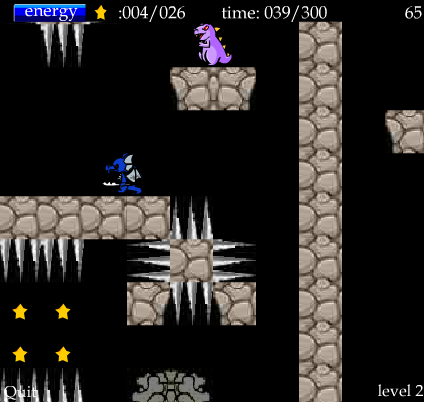 At the end of level 1, for example, you should make Valrigard face away from the horizontal-facing spikes on the right. If you don't, they will kill him. In levels 11 and 19, you can access the bonus level through the small red door, which can give you a serious point boost! If accessed through level 19, the bonus level cannot be escaped. After you run out of energy, you will fall forever until you run out of time. If you have any remaining lives, you will start the bonus level over again and you can resume collecting stars. Doing this should get you a much higher score than beating the game! There is a glitch where Valrigard may become stuck in the floor. This is usually caused by him bumping his head on the ceiling in narrow spaces. To prevent this from happening, fly next to the ledge just below the opening and go forward. He will usually catch the corner of the ledge and walk up into it. If you do become stuck, you'll have to wait for the timer in the level to run out. If you quit the game (using "Quit" on the lower left-hand side of the screen) it won't let you send in your current score. You can reset the game until you get 100 points out of the first mystery box. Mystery boxes can award 100 points more than once in one play through. Valrigard's hitbox is uneven, so make sure he faces away from spikes when he passes by them. When attacking enemies, swing your sword a little early to prevent accidental death. When attacking Korbats, you can defeat them by swinging your sword just beneath them. This is safer than attacking them head-on. When you need to get around Splykes, you can pass through them without getting hurt by swinging your sword if they are spinning. You can attack cannons for points, but you can't kill them. When you start level 16, you will be right above a spike pit, so be prepared to fly! Make sure to visit the bonus level! It can be accessed from levels 11 and 19 through the small red doors. The ones in the other levels are inaccessible. 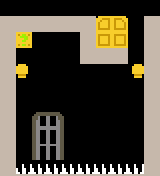 Below are all of the levels in the game, sans level 20, which is simply a small room for the final boss. Awarded if you are in the top 50 on the high score table of Escape from Meridell Castle when trophies are awarded daily.